Two-time Golden Glober winner Hugh Laurie is back one last time as TV's favorite misanthrope Dr. Gregory House in the hit series' eighth and final season. When House returns to Princeton-Plainsboro Teaching Hospital after an unconventional release from his prison sentence, he finds himself under a surprising new chain of command and dealing with personnel changes to his staff. 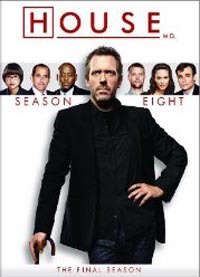 Together, House and his new team take on the most baffling medical cases yet and face challenges of both the mind and heart as this television phenomenon comes to a close with these final 22 gripping episodes from this beloved and brilliant show.